In a public petition released today, more than fifty educators and researchers, including some of the most well-respected figures in the field of education, pledged support for the boycott of the Illinois Standards Achievement Test (ISAT) by teachers at two elementary schools in Chicago, Saucedo Scholastic Academy and Drummond Elementary School and called on Chicago’s mayor and schools chief to rescind threats of punishment for those who participated in the action. Among the signers of the statement are former US Assistant Secretary of Education Diane Ravitch, Chicago Teachers Union President Karen Lewis, American Federation of Teachers President Randi Weingarten, and activist and educator William Ayers. To add your name to the petition, send an email to educatorsolidarity@gmail.com. CELEBRATE CHICAGO’S TEACHERS OF CONSCIENCE, DON’T PUNISH THEM! Teachers at two public elementary schools in Chicago, Saucedo Scholastic Academy and Drummond Elementary School, have refused to administer the Illinois Standards Achievement Test (ISAT). By taking this bold action at great personal risk, these teachers are standing up for authentic teaching, learning, and assessment. We believe that these teachers are heroes who are worthy of praise and thanks, not punishment and censure. The teachers at these schools believe that boycotting this test is in the best interest of their students. Hundreds of parents and students agreed. At Drummond, 112 students out of 178 students refused to take the test. 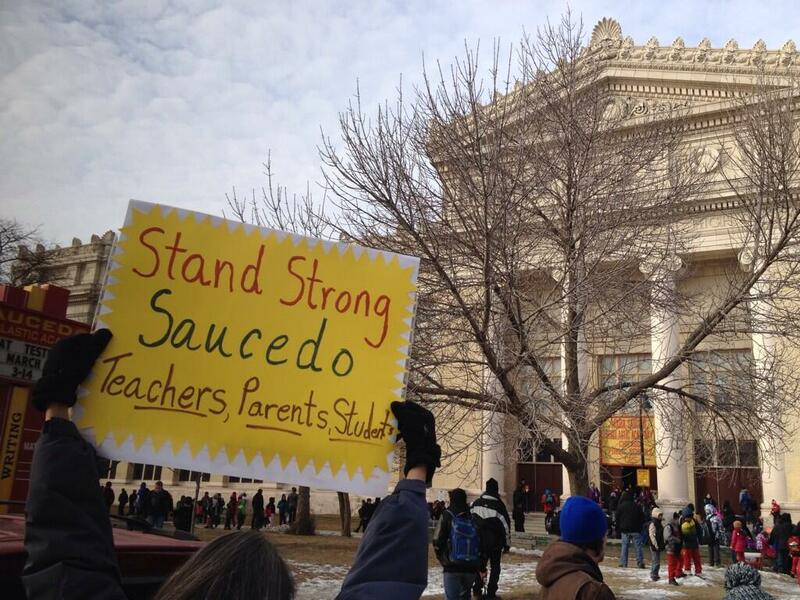 At Saucedo, roughly 450 of 1200 students refused also. For teachers who declined to administer the test, this was not a day off — they were able to conduct actual lessons with students who opted out. Threatening to punish teachers who prefer to teach rather than give standardized tests is not in the best interest of students. The ISAT test is being phased out, and will not be given next year. The results from this test will not be used to improve teaching and learning, to determine grades or promotion in Chicago Public Schools. It’s only purpose is to satisfy the accountability requirements of the No Child Left Behind (NCLB) legislation. NCLB demands that schools raise test scores every year, pressure which has led to an abusive over-emphasis on standardized test preparation nationwide. Like early participants in the Civil Rights Movement, the teachers at Saucedo and Drummond who have refused to administer the ISAT have taken an enormous risk for what they believe is right. And like those early Civil Rights protesters, they are facing intimidation and threats that they may be fired or lose their teaching licenses. We, the undersigned, call on Mayor Rahm Emanuel and Chicago Public Schools CEO Barbara Byrd-Bennett to stop all threats and punishments directed at the teachers of conscience at Saucedo Scholastic Academy and Drummond Elementary. Very disappointed to see so few professionals at Chicago universities on this list. One fromU of C, one from U of I – Chicago, one from DePaul, (don’t expect to see Radner of DePaul as she makes a ton from selling her version of Common Core garbage to CPS schools) and no one from Loyola, Northeastern, National Louis …. de autoridad y preservan la etiqueta Follow para sus links.